For years soul-winner Sumner Wemp has urged folks to share the gospel whenever and however they can. After all, he says, you're just offering people a ticket to heaven! A general-purpose tract with an unusual approach that people can easily grasp. Your Ticket To Heaven Esv Tracts - Pack Of 25 by Wemp, Sumner was published by Crossway in October 2006 and is our 6334th best seller. The ISBN for Your Ticket To Heaven Esv Tracts - Pack Of 25 is 9781682162903. 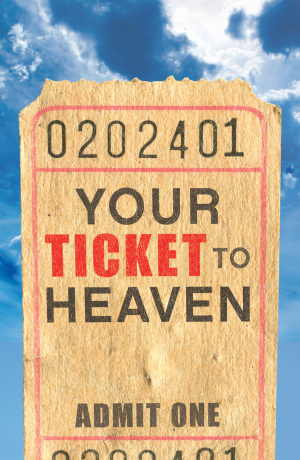 Be the first to review Your Ticket To Heaven Esv Tracts - Pack Of 25! Got a question? No problem! Just click here to ask us about Your Ticket To Heaven Esv Tracts - Pack Of 25. Please could you tell me what the text is , thanks. A:The full text of this tract is as follows: Your Ticket to Heaven May I offer you a ticket to heaven? You don't have to pay for it, and that's a good thing, because you could never afford to buy it! It's free, but only because someone has already paid the ultimate price for it. God loves you and not only wants you to have a fulfilling life on earth, he also wants you to live with him in heaven forever. He's the one who offers you a paid-in-full ticket. No one wants to go to hell where there will be no joy and no pleasures whatsoever, and God doesn't want anyone to go there either. The Bible says that God is "not wishing that any should perish" (2 Peter 3:9). But there is a problem with getting that free ticket. We have all done wrong-we have all sinned, haven't we? God's Word says "If we say we have no sin, we deceive ourselves" (1 John 1:8). Sin pollutes-it makes us unclean, unfit for God's presence in that wonderful, perfect place called heaven. Sin penalizes-it separates us from a sinless God, "For the wages of sin is death" (Romans 6:23). In short, our sinfulness blocks the delivery of the ticket that we need to get into heaven! Who paid for it? Wait! There's good news! Jesus Christ, the Son of God, came to earth to be born and to live his life without sin. He "suffered once for [our] sins, the righteous [one] for the unrighteous [all of us! ], that he might bring us to God" (1 Peter 3:18). When God "laid on him the iniquity [sins] of us all" (Isaiah 53:6), Jesus cried out, "My God, my God, why have you forsaken me?" (Mark 15:34). The answer is simple and profound: Jesus was separated from God because he took your place and mine on the cross, and by dying he paid in full the "wages" our sins had earned. Then he rose from the dead, was seen by hundreds of people, and is alive today so you can know him and receive the gift of eternal life-your ticket to heaven. That's right! The Bible says, "to all who did receive him [Jesus], who believed in his name, he gave the right to become children of God" (John 1:12). That is fantastic! You can become a "new" person-born of God-to start a brand-new life that pleases God. And, of course, all God's children have a ticket to heaven! Do you want it? It is no accident you were given this offer of a ticket to heaven. God has made sure you can receive it. The whole issue is, did Jesus pay for all your sins or didn't he? God said he did. Trust God that it is so. "Whoever believes in the Son [of God] has eternal life" (John 3:36). Just as a man says, "Yes, I will take this woman to be my wife," God wants you to tell him, "Yes, I will take Jesus to be my Savior. I believe that he is the only way to heaven." The Bible says, "Whoever has the Son [Jesus] has life" (1 John 5:12). If you believe that God's way to heaven is the only way, you can "claim your ticket" by telling God in words like these: Dear God, I have sinned. I know I have offended you in many ways. I am so sorry. I believe that Jesus suffered and died for my sins, paid my debt in full, and rose again. Jesus, I believe in you and thank you for what you've done for me. Please save me from the penalty of my sins, and give me a new birth and the power to live for you. Thank you for this offer to spend eternity with you! Remember what John 3:36 says: "Whoever believes in the Son has eternal life." Do you now believe in Jesus as your Savior, your only "ticket to heaven"? Do you have everlasting life, like God said?